PERTH, Australia (AP) — Will Genia and Quade Cooper exhibited their attacking flair to lead Australia to a 36-20 bonus-point win over Argentina in a Rugby Championship match on Saturday. 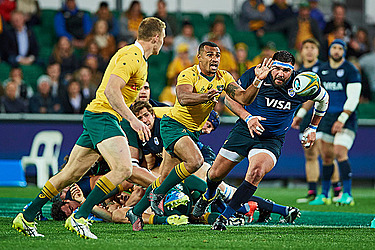 The Wallabies scored three tries in the opening 12 minutes, and finished the match with five overall. Genia was influential throughout the game, scoring two tries in a man-of-the-match performance. Cooper set up two tries with inside passes that exposed Argentina's defense. Australia has won two matches in a row after beating South Africa 23-17 last week in Brisbane. The Brisbane win ended a six-match losing streak for the Wallabies. The Wallabies scored two early tries in their 29-15 win over Argentina in last year's World Cup semifinal, and on Saturday Australia once again scored quickly. Outside centre Samu Kerevi touched down after just 43 seconds following a bad clearance kick from Argentina. Perth-based Dane Haylett-Petty was the next to score following a well-worked lineout and inside pass from Cooper. And the score was 21-0 after 12 minutes following some strong play from Genia, who unleashed a heavy tackle to knock the ball loose from Nicolas Sanchez, before kicking the ball forward. The Wallabies' scrumhalf then outsprinted a Pumas defender to collect the ball and crash over the line. Australian prop Scott Sio was sin-binned in the 33rd minute for foul play, but the Wallabies still entered halftime with a 21-6 lead. 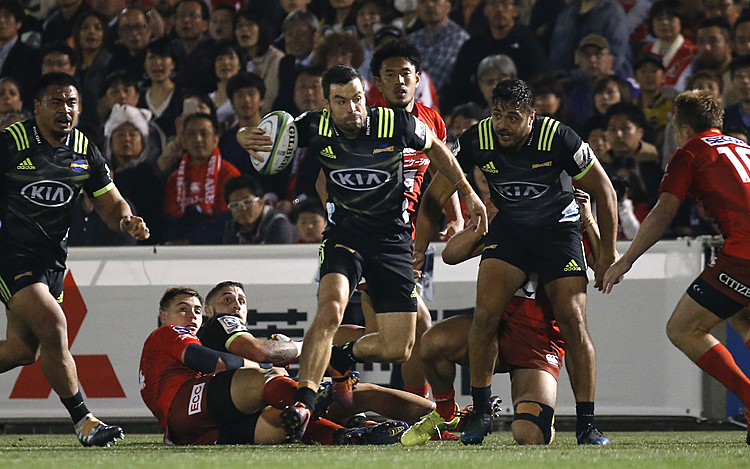 Argentina winger Santiago Cordero scored early in the second half to reduce the lead, but Sean McMahon bounced off four defenders to set up Genia for his second try in the 52nd minute. Cooper unleashed an inside ball to set up Michael Hooper's try in the 64th minute and the margin increased to 20 points, and the Wallabies were not threatened for the rest of the match. "I'm very proud of our first half, we made close to 100 tackles," Australia captain Stephen Moore said. "We have won our last two games, so that bodes well for the rest of the season." Both those matches will be on the road. The Wallabies play South Africa at Pretoria on Oct. 1 and conclude the Rugby Championship at Twickenham in London against Argentina on Oct. 8. New Zealand clinched the Rugby Championship when it posted its fourth consecutive bonus-point win, beating South Africa 41-13 earlier Saturday. Australia 36 (Will Genia 2, Dane Haylett-Petty, Michael Hooper, Samu Kerevi tries; Bernard Foley 4 conversions, Reece Hodge penalty), Argentina 20 (Santiago Cordero, Facundo Isa tries; Nicolas Sanchez 2 conversions, 2 penalties). HT: 21-6.